A student bicycles through the Safe Moves City. 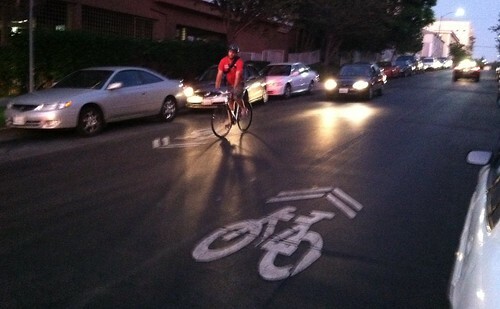 Improving the safety of our bicyclists is a huge priority for LADOT. It’s a driving force behind the work we do at the Bicycle Program and the reason we’re working to install more bike paths, lanes and routes in the city than ever before. However, providing adequate bicycle infrastructure is only one component. To truly create a better cycling environment and see safety improvements, we need to teach current and future bicyclists about safe bicycling practices. 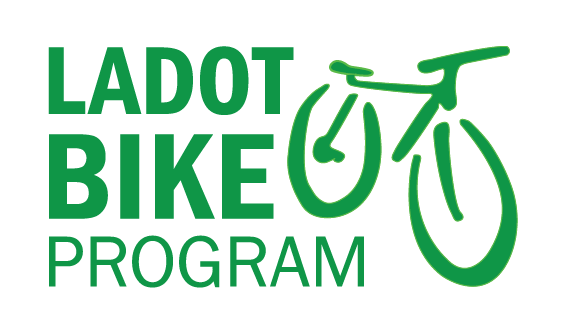 Currently, LADOT contracts with the Safe Moves program to educate over 175,000 students a year about habits and skills they can adopt to be safer bicyclists. Safe Moves works with students to teach defensive bicycling habits such as making eye contact, checking over one’s shoulder, and being aware when walking and bicycling. An interactive course allows students to bike through a mock city where students are exposed to the same risks posed by a real-life urban cycling environment. Although the course is designed to create a fun experience for the students, it’s also designed to guide each student through traffic issues they could encounter. 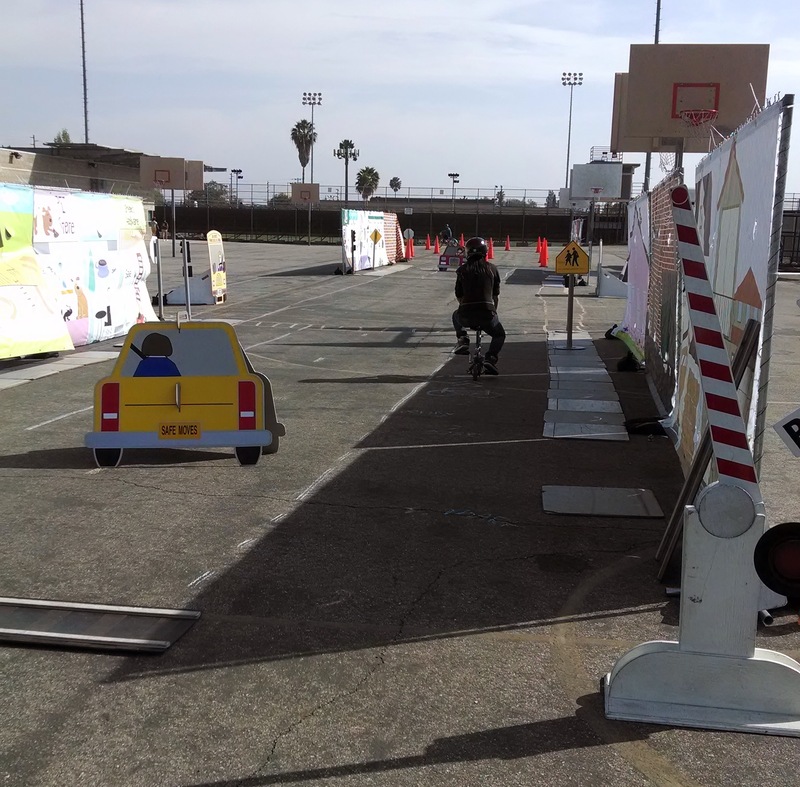 The mock city course features railroad tracks, cars laving and entering driveways and signalized intersections. Instructors demonstrate where the door zone is, proper signaling techniques and the dangers presented by riding the wrong way against traffic. 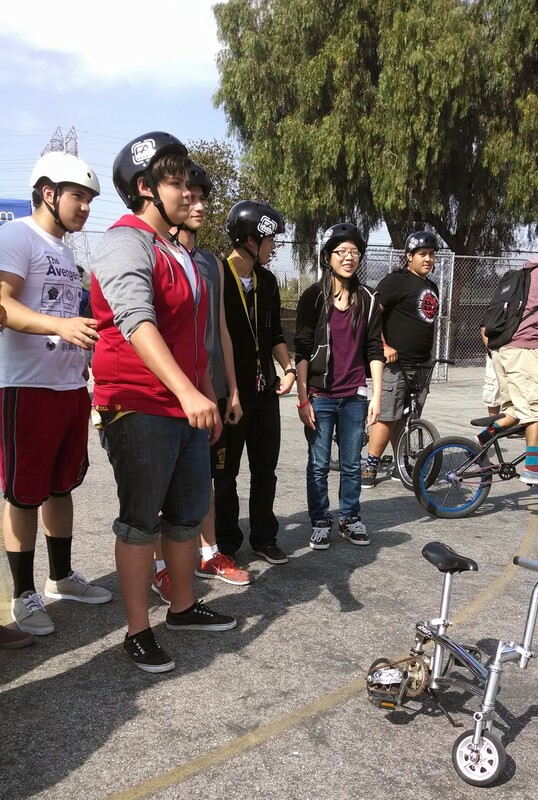 In addition to educating students about safe bicycling skills, the Safe Moves program create a social environment where students can feel comfortable asking questions and try out different types of bicycles. Safe Moves strives to create a dialogue about how students currently travel and the alternatives to driving to school. Students listen to an instructor before trying out the course. Helmets provided by Safe Moves. If you’re interested in bringing a Safe Moves workshop to a school, you can contact Safe Moves at their website or you can make a request with your local principal or school administrator. Safe Moves hosts workshops during school hours (usually one per grade level), after-school workshops, community, and weekend events so you can work with Staff to design a workshop that fits your community’s needs. The Three Foot Passing bill introduced by Assemblymember Steven Bradford (D-Gardena) passed the State Senate on August 26th. Today, it received a final vote in the Assembly, passing 51-23 at about 10:30am. It now heads to Governor Jerry Brown’s desk to be signed into law. A driver of a motor vehicle shall not overtake or pass a bicycle proceeding in the same direction on a highway at a distance of less than three feet between any part of the motor vehicle and any part of the bicycle or its operator. Similar legislation has been vetoed twice previously by Governor Brown, most recently in 2012. This legislation contains none of the issues he raised with previous “Three Foot” efforts, including provisions requiring drivers to slow down if they cannot pass with three feet of clearance and allowing drivers to cross the centerline to pass bicyclists. Those omissions notwithstanding, this legislation is a step forward in protecting all road users and should become law. If you feel as strongly about this as we do, we ask that you contact the governor’s office to express your support for the Three Feet for Safety Act, and push for him to sign it into law. “Give Me 3,” will it become a law this time? Although two recent attempts at passing legislation that would require motorists safely leave at least three feet of space when overtaking bicyclists have failed due to unclear language, advocates of such a law have not given up. Back in February, Assemblymember Steven Bradford introduced AB 1371, the latest iteration of a three-foot passing bill. AB 1371 sailed through an Assembly vote in May and yesterday it passed with the Senate Standing Committee on Transportation and Housing, 10-0. Next up is a vote on the Senate Floor, if you would like to see the bill move forward, contact your local Senator and let them know you support AB 1371. We just got word of some great news from our friends at the California Bicycle Coalition. SB 1464 – CA’s safe passing distance bill – just passed the Assembly Appropriations Committee with no group expressing opposition. The bill was also deemed to have no fiscal impact by the CA Dept. of Finance. SB 1464 could now head for a full Assembly vote within the next two weeks. For the latest amendments to the bill, click here. 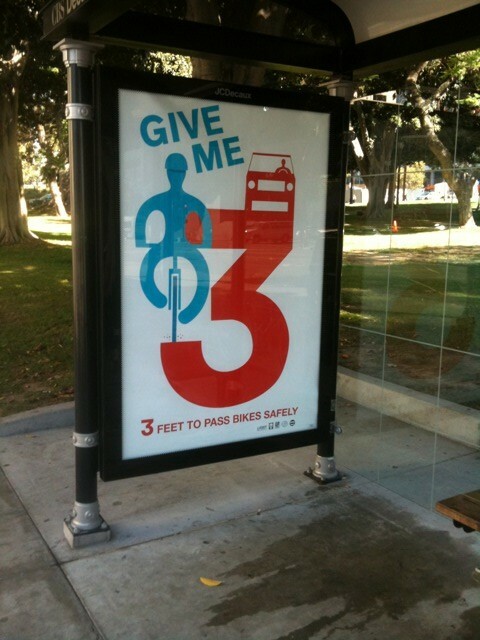 The “Give Me Three” campaign is being sponsored by the California Bicycle Coalition (CBC) and the City of Los Angeles. Existing law requires that drivers keep a “safe distance” from bicyclists when passing, however this vague wording makes it difficult to enforce and leaves too much room for poor judgement. This new bill would change the California Vehicle Code to require a minimum of 3 feet when passing. To find out more about SB 1464 and the “Give me 3″ campaign, check out the CBC’s FAQ sheet or read the bill’s full language. Senate Bill (SB) 1464, more commonly known as the “Give me 3” bill, unanimously passed it’s first senate subcommittee hearing, with an 8-0 vote 0n April 17th, before the Transportation and Housing Committee. What’s Next: After undergoing review from the Senate Appropriations Committee, the bill is set to be voted on by the Senate, possibly sometime next week. You can contact your local Senator and show your support for the “Give me 3” campaign, Sb 1464 by following this link. UPDATE: The California Bicycle Coalition (CBC) urges you to send the committee chair a message right now. Simply add your name and contact info into the form and hit send — your message will be emailed to the CBC and they’ll make sure it’s delivered to the State Capitol. Senate Bill (SB) 1464, the California three foot safe passing distance bill – is coming up for review in the CA State Senate’s Transportation and Housing Committee on April 17th, 2012. 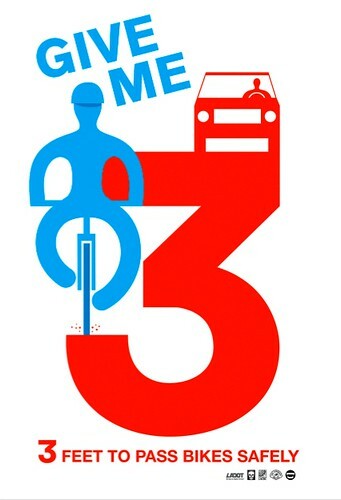 SB 1464 – better known as the “Give me 3” campaign – will require drivers to give bicyclists at least 3 feet of clearance when passing them from behind. California is hoping to join nineteen other states and the District of Columbia to enact a safe passing distance law. You can show your support for SB 1464 by letting members of the Senate’s Transportation and Housing Committee know how important this bill is to you! For more information about SB 1464, visit the FAQ page on the Give Me 3 campaign website or you can read the bill’s language for yourself here.